Wheat is a popular ingredient in alcohol-free beer because its high protein and gluten content help create a heavier brew that better mimics the mouthfeel of a full-strength beer. Hence why you’ll find a decent sprinkling of wheat beers on the shelves – real or virtual – when you’re shopping for non-alcoholic beer. And why some alcohol-free brews not styled as “wheat beers” still include a pinch of wheat alongside the main grain, malted barley. One area that’s famous for its wheat beers is the southern part of Bavaria in Germany. Yet this style almost died out in Germany the 1870s due to the popularity of a new type of beer (lager) taking the bier kellers by storm. It was eventually saved in part by Georg Schneider I and his son Georg Schneider II who had recently acquired Munich’s Weisses Brauhaus from King Ludwig and were among the first commoners in Germany to brew beer commercially. 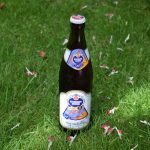 Schneider Weisse continue to specialise in wheat beer and are now based in Kelheim, having relocated when allied bombs destroyed the Munich brewery during World War 2. 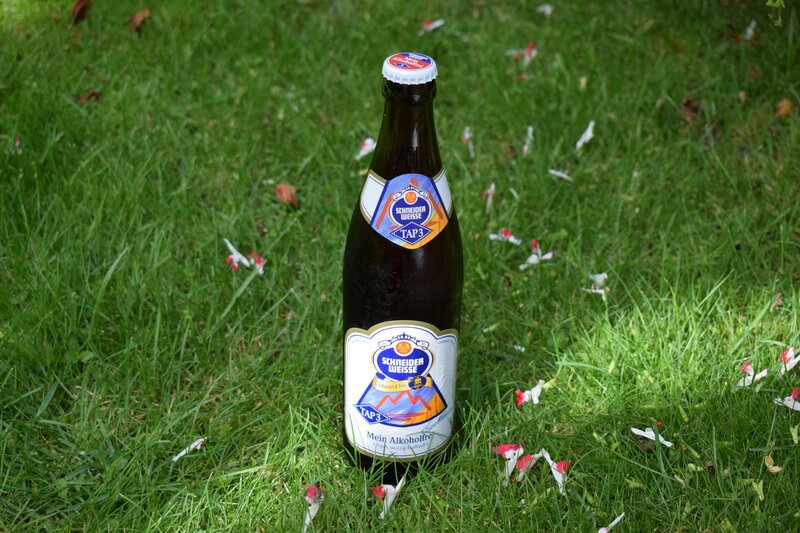 Still, family-owned, the brewery first produced an alcohol-free wheat beer in 2002. Each style of beer the brewery produces comes with a tap number, the alcohol-free version using “Tap 3”. This isn’t a beer to drink from the bottle because it looks spectacular when poured, with a chunky off-white head of foam sitting on top of the beer, which is hazy and chestnut coloured. The dark colour suggests a majority of darker barley malt in the grain bill. The initial aroma is also more reminiscent of a non-wheat beer, but the unmistakable sweet, cereal-like smell of the wheat soon fills your nostrils. There’s a dash of clove aroma in there too. And very little from the hops, as expected in a wheat beer. There’s a lot of carbonation in the glass, but it’s smooth and creamy in the mouth and tingly rather than fizzy. You can definitely feel the extra proteins from the wheat suspended in the beer as you drink. There’s none of that barley maltiness in the flavour, just the sweet cereal taste of the wheat with undertones of green banana. I didn’t detect any of the cloves from the aroma. There’s no bitterness in the taste to begin with, but it grows as the bubbles lessen and eventually combines nicely with the sweetness to produce a perfectly balanced beer. The finish is dry, with a dab of bitterness in the aftertaste. 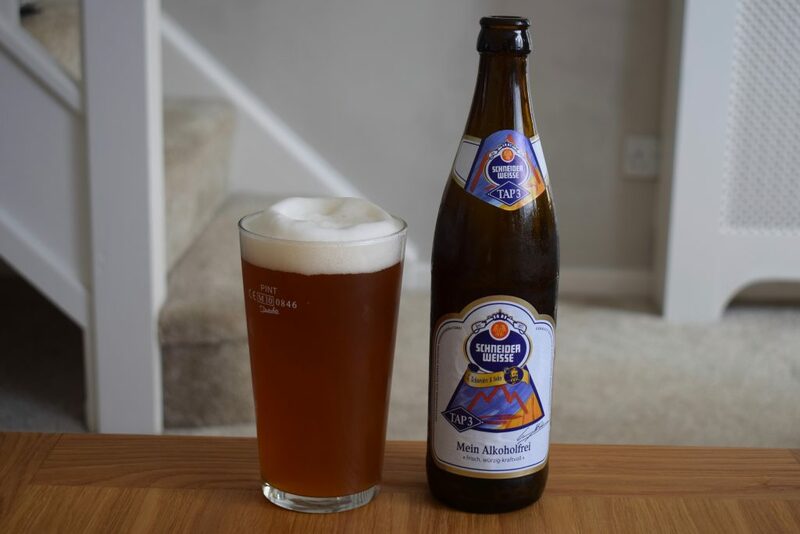 Wheat beers often make for a good alcohol-free beer and Schneider Weisse “Alkoholfrei” doesn’t disappoint. And while the aroma isn’t anything to get too excited about, it’s backed up by a fabulous mouthfeel and a nicely balanced sweet and bitter flavour.